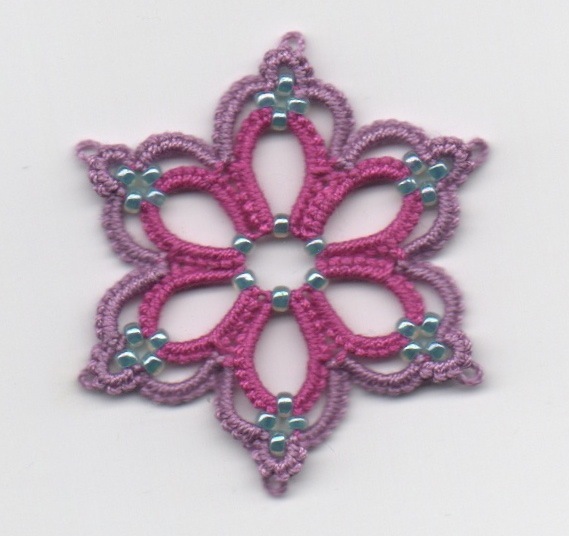 I get side-tracked easily... but that's what I love about tatting! There seems to be an endless source of inspiration at our fingertips. So this post doesn't follow on from the previous as I had planned but is about something different altogether. I saw this flower on In Tatters, done by Sarah Wood and I followed the link. It took me to Corina Meyfeldt's blog which I hadn't seen before. She has lots of other pretty things on there, worth a visit. 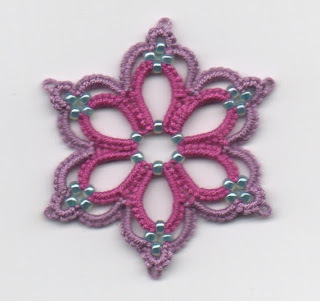 And here is the link to the pattern: Beaded Flower Pattern. I really like the way she used beads in this, it does give the flower a lovely shape. Four-bead picots are not new but I'd not seen a join done into the beaded picot like this before. Great idea. The green one below is done with the stitch count as per the pattern. In the pink one above, I changed it a bit (smaller petals). And I think I prefer a smaller stitch difference between the first and second round on the petals (as in the pink). Both a pretty though. I do notice that her white flower with same stitch count as my green looks more like my pink flower... ?? The smaller blue one is done in Altin Basak 50 and there are also even fewer stitches in that one. 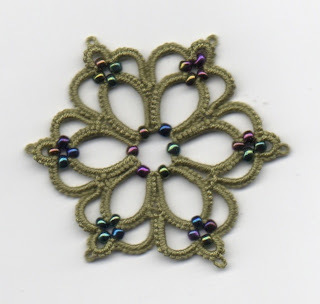 A great little pattern and an interesting use of beads, thanks to Corina for sharing her ideas. Ooh, thanks, I'm going to follow your links, those are so pretty. I saw the same pattern yesterday and loved it but did not save the link! Thanks! My pleasure - I love finding new things and sharing my discoveries. Yes, Jenny, I think it would! J'ai également marqué cette page ce matin et je me demandais justement quelle était la technique pour les picots à 4 perles? Je ne l'ai encore jamais rencontrée. 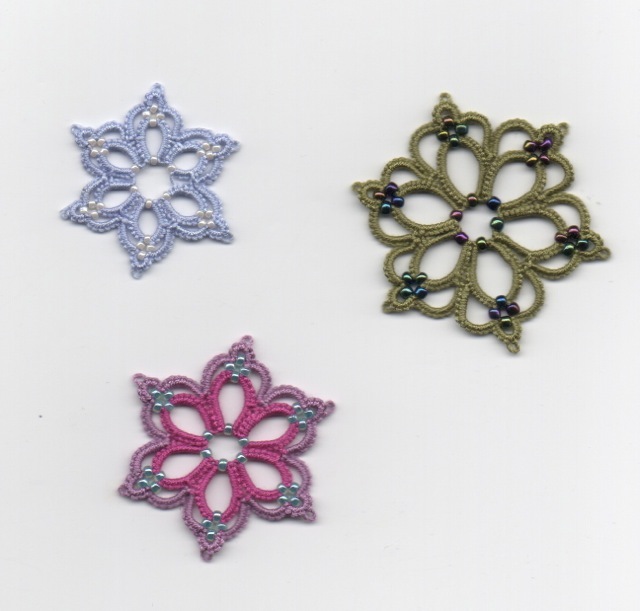 Bonjour, le picot à 4 perles n'est pas difficile. Les perles doivent être enfilées sur le fil de la navette avant de commencer. Puis il s'agit de glisser 3 perles sur le fil qui sera enroulé autour de la main gauche avant de faire un anneau, rendu au picot, glisser ces perles plus une qui vient de la navette et compléter le picot puis l'anneau. Hmmm, ça paraît toujours plus compliqué en mots. Je crois que j'ai besoin de faire une nouvelle vidéo! Merci beaucoup pour ton explication. J'y ai repensé hier soir et la solution m'est apparue avant de m'endormir :) Il faudra que j'essaye. I've seen it at intatters too and It captured me! your variation makes it even a bit more elegant! The pattern sure deserves a try! first one is stunning! Thanks for sharing, it's a great motif with beads, and I love your color choices. I'm off to get the pattern :) Many thanks to Corina as well. Lovely, thanks for showing and the link to the pattern! I made a motif too, as a pendant. I think I shall have to try this pattern. Thanks for sharing. Mille-Fleurs pattern ready - and a Draw!